In early May, Congress allocated more than $1.3 billion in funds for refugee assistance and included specific language to try to ensure that at least some of the money is used to assist persecuted religious minorities, including Christians, Yazidis, and Shia Muslims—all groups the State Department deemed victims of genocide in 2016. "There is congressional legislation … that calls for the U.S. government to stop excluding the genocide-targeted minorities in Iraq," Shea said. "This has been a pervasive problem that this aid has not been getting to them." "Iraq is home to one of the four largest remaining Christian communities in the Middle East that are about to become extinct," she said. "Presidents George W. Bush and Barack Obama made catastrophic mistakes that left these communities on the brink of extinction, but it's going to be on President Trump's watch as to whether they survive or become extinct—it's going to be his policies that make or break the situation." "Christians and Yazidis need to be able to go back to their towns just to hold them—it's a big national security priority for the U.S.," she said. 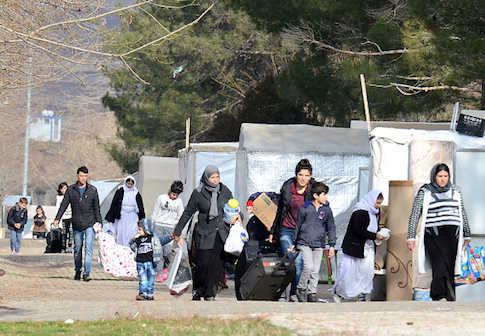 "It would be a deathblow to pluralism and the prospect of religious freedom and diversity in any future Iraq," the senators wrote, if these victims of genocide don’t receive the humanitarian aid Congress tried to direct to them. Instead, Charles Faulkner of State's Bureau of Legislative Affairs cited a list of U.S. efforts to help the "plight of religious minorities in Iraq" and said the department "shares your grave concern about the situation facing Iraq’s religious and ethnic minorities." The letter also restates the State Department’s policy and that of the United Nation's of distributing U.S. relief based on means-tested need, instead of the genocide designation providing some priority for targeted communities on the verge of extinction. Faulkner said the State Department "makes efforts" to ensure that the needs of "minority community members" are "taken into consideration," when there are concerns that these communities don’t have access to assistance. Update 10:04 a.m.: This post has been updated with more information. This entry was posted in National Security and tagged ISIS, State Department. Bookmark the permalink.